Sports. For those active individuals, the enhancement to your peripheral vision can be amazing. Better quality of vision. In certain instances, both forward and peripheral vision can be improved. Cosmetics. You feel that you look better in contacts than glasses. You want ‘baby blue eyes’ for a fun evening out. Freedom. You want the freedom to wear funky sunglasses that are not available in your glasses prescription. Convenience. Contact lenses don’t fog up when you go from outside to inside on those cold Canadian winter days. Health. People with certain eye health problems (i.e. keratoconus) can only achieve good vision through contact lens wear. 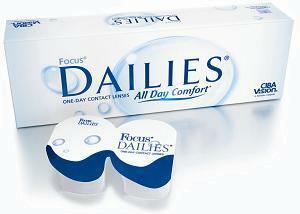 Our practice caters to the contact lens wearer. Whether you already wear contact lenses (and would like a change) or if you are simply intrigued with trying something new, you have come to the right office. We have successfully fit many patients who previously were told they could not wear contacts or who were unsuccessful with an earlier brand. In addition, several of our doctors fit specialty lenses designed for irregular corneas (i.e. Keratoconus, Pellucid Marginal Degeneration), corneal transplants, scarred or highly astigmatic corneas. There are continually new materials being developed and our staff and doctors are happy to discuss the various options with you. There are many reasons to consider wearing contacts and we feel it is a personal decision.